On December 25, 2014 until the first week of January 2015, no foreign films would be shown in Philippine theaters. 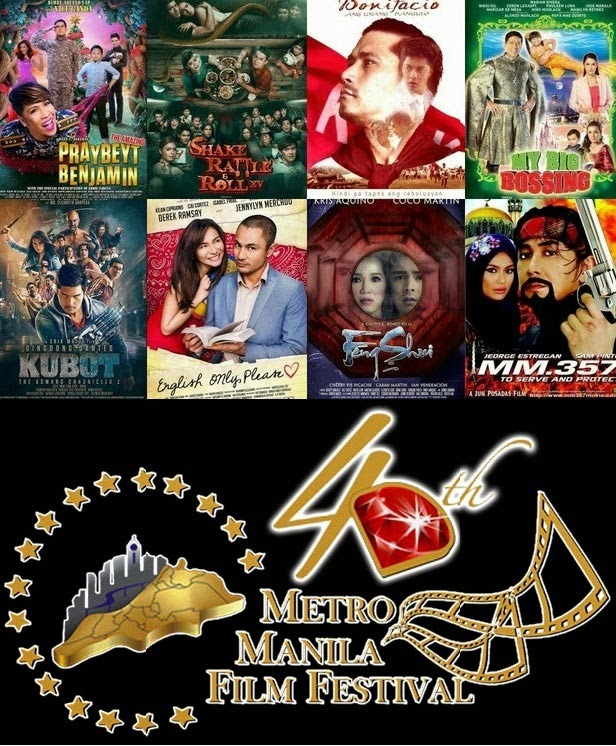 This is done annually, and is more popularly known as the 40th Annual Metro Manila Film Festival. It aims to showcases locally made films. This year thirteen film entries were presented to the MMFF but only eight were chosen to be official entries. A historical drama starring Robin Padilla and Vina Morales, this film tackles the life of one of the most famous national heroes who was also alleged to be the first president of the Philippines. This was directed by Enzo Williams and was being released by Philippians Productions. A sequel to the blockbuster Feng Shui back in 2004. Kris Aquino returns as Joy Ramirez, a previous owner of a cursed ‘bagua’ which brings both good and bad luck. Joining her is Coco Martin playing Lester, who would experience the similar curse as Joy had. This film was directed by Chito Roño and was jointly produced by Star Cinema and Kris Aquino Productions. A remake of the film launched on 1987 of the same name, it is a movie about Lt. Jamal played by ER Ejercito. He is set to rescue a Muslim princess named Ameerah, played by Sam Pinto. It was directed by Jun Posadas and was produced by Scenema Concept International and Viva Films. Ryza Mae Dizon and Vic Sotto would once again star together in a spin-off blockbuster movie from last year. It features a fantasy setting which also stars Marian Rivera, ManilynReynes , Nikki Gil, Pauleen Luna, Wally Bayola, Jose Manalo and Paolo Ballesteros. It was directed by Joyce Bernal, Marlon Rivera and Tony Reyes, produced by Octoarts, MZET and APT ENT. Vice Ganda returns as Colonel Benjamin ‘Benjie’ Santos VIII, a gay person who is in the military. It is a sequel to the film, The UnkabogablePraybeyt Benjamin. This time joining Vice are Richard Yap, Daniel Padilla, Julia Barretto, Bimby Aquino-Yap and Alex Gonzaga. DirekWennDeramas still directed this movie and it was co-produced by Star Cinema and Viva films. From the famous franchise of Shake, rattle and Roll, this year, Dennis Trillo, Carla Abellana, Matteo Guidicelli, JC De Vera, Erich Gonzales and Lovi Poe would scare the movie goers with this film from Regal Films.